packages for an unforgettable adventure. 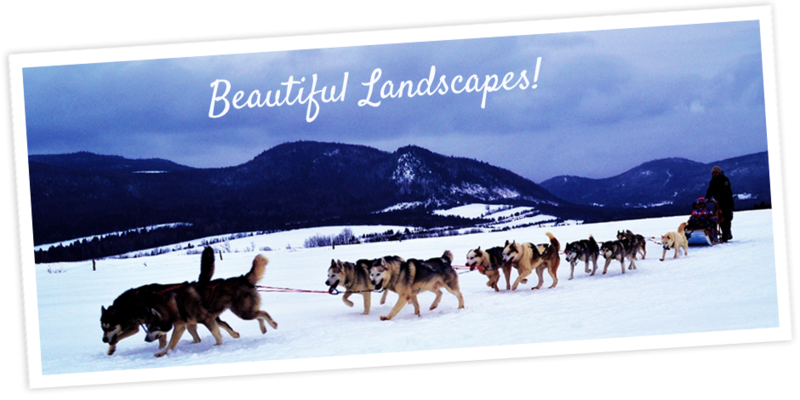 Whether it is a half-day or 1 to 3 days excursion, the supervised by qualified guides, Alexandra, Jean-François & Tobie, you will discover a legendary means of transport and appreciate the submissiveness of the huskies. The departure take place in a very turbulent manner. One by one, the dogs are removed from the kennels to be harnessed. They’re so excited, nervous and impatient that they cannot wait to take to the woods. Showing their pleasure, they are attached to the sleds one at a time. This commotion always accompanies the harnessing ceremonial. After the departure, the dogs settle down and the sleds resume their normal rhythm. Well secured to the sled, luggage ande passengers calmly continue the rest of the excursion. Half-day package includes a 20 to 30 km in the heart of the Charlevoix forest with the unique scenery of the Saint-Lawrence River and the Laurentienne Mountains range. Charlevoix was awarded “Biosphere Reserve” by UNESCO. Perhaps you will get a glimpse of a hare, squirrels or partridges. You will get a chance to observe the tracks of animals that roam around the region: coyotes, foxes, beavers, hares and maybe even a wolf! This price includes : equipment, clothes (loan) and guide. Take notes on bookings 25% of the price is required by credit card. Thank you for your understanding! P.S. the tax it is included in the price but not the tips. THE PERFECT INTERMEDIATE PACKAGE. A complete day in the presence of the huskies and the musher. You will go for a ride at the dogs’ pace on a circuit of 40 to 50 km. 9 am : Arrival at the kennel, outfitting and harnessing of dogs. 9 : 30 am : Departure for the hike on dog sled with our guide. 12 pm : Dinner at one of our cottages in the heart of the Charlevoix forest. 4 pm : Return to the kennel. This price includes : equipment, clothes (loan), lunch and guide. Arrival at the kennel at 1 pm, outfitting and harnessing of dogs. The departure for the sled ride accompanied by our guide will be around 1:30 pm. After a few winter-funfilled hours with our guide, we will reach the insulated cottage where it will be possible to eat a typical canadian meal. During the evening, it will be possible to help feed the dogs who, needless to stay well deserve it! We will share our experiences of the day by the warm glow of the fireplace before retiring to soft and confortable beds. The following morning, after a healthy breakfast, we shall harness the dogs in order to continue our ride and admire the beauty of our Charlevoix forests, the river and mountains. Before we end the excursion, we will stop by our log-cabin where we will enjoy a light snack. We will return to the kennel before 11:30 AM. This price includes : equipment, clothes (loan), 1 night, 1 breakfast, 1 supper and guide. For nature and dog lovers, this is the ideal choice. To learn all about harnessing and feeding dogs and share a musher’s way of life. A two days, 80 to 100 km tour. 9 am : Arrival at the kennel, outfitting and then harnessing the dogs. 9 : 30 am : Departure for the sled ride with our guide. 12 pm : Dining in one of our pine cottage in the heart of the forest. 1 pm : During the second stage, we will reach the insulated cottage (wood heated camp, propane lighting, with chemical toilet, no shower) where we will dine and will spend a good night. After breakfast, harnessing of dogs and departure for the first stage that will take us to the place of our lunch, by an open fire on the snow, weather permitting. Last step, we will return to the kennel. This price includes : equipment, clothes (loan), 1 night, 1 breakfast, 2 lunches, 1 supper and guide. Arrival at the kennels at 9:00 am, outfitting. We will be leaving the kennels towards Ste-Agnès, where our camp is located for the night. During the day, you will enjoy the landscapes of Charlevoix’s forest a fire in the snow will warm you up and a hot meal will be served the trapper’s way. Once to the cottage (no shower) we will take care of the dogs while the wood-stove will be rumbling, warming up our shelter. A confortable evening in perspective. After a good breafast, will be heading towards another shelter. May be, atlunchtime will be eating at Ti-Père cottage? Probably, will cross tracks of hares and coyotes, indicating us that we are not alone in the forest. Before the sunset, we will get back to our camp (in a tent or a cottage as you wish). Today, we will be seeing the river, the beavers and des Eboulements village. Actually, the tracks will lead you to view-points of the river, village and a beaver’s lake. Still many discoveries! Lunch at Ti-Père and its warm store. At the end of the afternoon, we will go back to the kennels. Let the sweet adventure continue! This rate includes : equipment and clothing (loan), 2 nights, 2 breakfasts, 3 lunches, 2 dinners, and the guide for the dogs. Designed for groups of 10 to 40 people, this one-day package can be adapted to your needs. Please contact us for further details. This package offers all the activities available according to your taste. From Domaine Le Pic Bois, in Saint-Aimé-des-Lacs, the day starts with a 20 to 30 km dog sled ride You will do some ice-fishing on the lake. You will sample the trout you caught as well as Karine’s prepared dishes. In the event of larger groups (from 30 to 40 people), we split them in two to insure their full appreciation of the activities. In the morning, part of the group leaves on snowshoes while the rest of the group goes dog-sledding on a 30 km circuit. At dinnertime, everybody gets together to eat and exchange impressions. In the afternoon, the groups switch activities. This price includes : equipment, clothes (loan), 1 lunch and guide for all activities. Take notes on bookings 25% of the price is required by credit card. Thank you for your understanding! P.S. the tax it is included in the price but not the tips. 9 am : Arrival at the kennels,outfitting and preparing snowshows. 9 : 30 am : Departure for an excursion in the beautiful Charlevoix woods with a guide. At halfway point of our excursion, a snack will be served in the teepee. Back to our starting point. This price includes : equipment, clothes (loan), snack and guide. 9 am : Arrival at the kennels, outfitting and preparing snowshows. 9 am : Arrival with the kennels, outfitting and harnessing of the dogs. 9 : 30 am : Departure for the sled excursion with our guide. 12 pm : Lunch in one of our splendid log cabins so typical in our ancestors time in the heart of the Charlevoix woods. 1 pm : After that, a guide will teach you about traps. After a few hours with the guide, we will put on our snowshoes and explore some of the traps in the forest on the way to the kennel’s cottage. This price includes : equipment and clothing (loan), 1 lunche, the guide for the dogs and the trapping.